Street Fighter II Video Slot Guide & Review - Casino Answers! 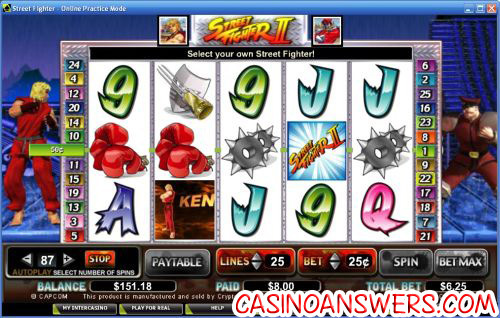 Street Fighter is a 5-reel, 25-line video slot developed by Cryptologic. It has a special wild feature, a bonus game, free spins, expanding wilds and scatter wins. 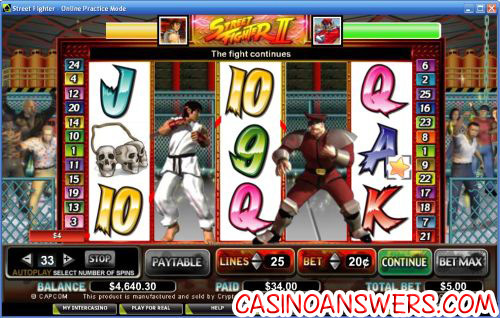 The slot machine is based on the popular Street Fighter video game series – Street Fighter II, in particular. You can play Street Fighter II at VIP Casino and Casino Joy. If you played any video games in the 90’s, you should be well aware of the Capcom Street Fighter franchise. It was a popular arcade game in the late 80’s and produced an even more popular sequel that really took off on the SNES gaming system. Street Fighter is a one-on-one fighting game where two combatants face-off against each other, each character with his or her own unique attacks. Cryptologic has taken the popular Street Fighter video game franchise and added it to its already vast selection of branded video slots, which include Marvel & DC Comic Book Slots. Bets on Street Fighter are $0.01, $0.02, $0.03, $0.04, $0.05, $0.10, $0.15, $0.20, $0.25, $0.50, $0.75, $1, $2, $3, $4, $5, $6, $7, $8 and $9 per payline. You can bet as low as one penny on a single line bet and as much as $225. The Street Fighter II video slot has a unique wild feature. When you first enter the slot machine, it will tell you to choose your own character – much like in the video game where you can choose your Street Fighter character to play as. Your choices are Ken, Ryu, Sagat, Chun Li and Guile. This will be your wild substitute symbol, along with M. Bison. Hit your character’s wild symbol and you will be treated to an animation with a voice announcing your character’s name. You may change your wild symbol at any time. Your wild symbol will only appear the second reel and M. Bison will only appear on the fourth reel. Along with the wild symbols of M. Bison, Ken, Ryu, Sagat, Chun Li and Guile, the other symbols on the Street Fighter video slot are the Street Fighter II scatter logo, Vega’s claws and mask, Balrog’s boxing gloves, Dhalsim’s skull necklace and Chun Li’s spikey cuffs. The top jackpot is Vega’s mask and claws – worth 5000X your bet for five of them. Balrog’s gloves are the second highest fixed jackpot at 3000X. Other symbols in the Street Fighter slot game are A, K, Q, J, 10 and 9. If your wild symbol appears on the second reel while M. Bison appears on the fourth reel, you will trigger the Street Fighter bonus game feature. Reels 2 and 4 will expand and the two characters will be ready for battle. You will be taken to a Street Fighter II battle screen, complete the music, voiceovers and sound effects of the original video game. All positions on the second and fourth reels will substitute for all symbols except the scattered Street Fighter logo. Reels 1, 3 and 5 will re-spin. Reels 1 and 5 will now contain action icons (fists, boots, fists & boots, star and no action). Your character will perform the Action Icons on the first reel. Bison will perform the Action Icons found on the fifth reel. Each action will inflict damage on the opposite character. Your actions will win your prizes, which will be multiplied by the total bet. Re-spins will continue until one of the characters is defeated. Bonus game wins will be added to your re-spin, payline and scatter wins. The Street Fighter bonus game is hard to trigger, but it will pay off once you are able to get it. Street Fighter II has an autoplay feature. It is very limited. Hold down the “+” button for as long as you need to get to your desired amount of autoplay spins. Hold it down long enough and it will move faster. For fans of the Street Fighter video games, Street Fighter II makes for an excellent online casino video slot game to play. Most people enjoy playing games with characters or themes that are familiar to them, which is most of the Street Fighter video slot’s appeal. Regardless of the brand the video slot is based on, we still feel Street Fighter is a good offering by Cryptologic and that Street Fighter fans who play at online casinos should check the game out at VIP Casino. Are USA players allowed to play the Street Fighter video slot for real money? No, players based in the United States cannot play this video slot and win real cash. For our US players, we think that video game lovers will enjoy the iSlots featured at the US-friendly Rival-powered Rockbet Casino. Are there any other Street Fighter slot machines? Yes, VIP Casino also has a Street Fighter IV slot that you can play at that online casino. For a Street Fighter clone video slot, please read our Ultimate Fighters Video Slot Review. Does the Street Fighter II video slot have a progressive jackpot? No, Street Fighter II does not have a progressive jackpot. It has a top fixed jackpot of 5000X your bet, which you can get by lining up 5 Vega symbols. VIP Casino does have branded video slots with progressive jackpots such as the Forrest Gump Video Slot, Braveheart Video Slot and Marvel Jackpot Slots such as the Wolverine Video Slot. Are there any casino games based on Street Fighter 2? Street Fighter 2 Slot Machine Guide? Street Fighter 2 For Dummies? How do you play the Street Fighter bonus game? Is there a Street Fighter progressive jackpot?